So I went to see her today to apologize for laying that on her. She would have none of it, of course, and during the course of our conversation mentioned that the George Washington Bridge was pink for October. Since moving to Manhattan eight years ago I no longer have a car so I don’t cross it often and am not in clear viewing of this ginormous bridge, so I was unaware. I wrinkled my face a bit and thought back to why I like pink: it makes you look younger. If it weren’t for that I wouldn’t mind if pink just disappeared. However, while I wrinkled my face it wasn’t accompanied by the usual pink vitriol. I mean, I said I would be happy if I never saw pink again, but that was about it. I’m having a hard time walking. My back and hip hurt a lot and I’m in a lot of pain right now. And when I went to the oncologist’s office this afternoon, I picked up a small pink ribbon pin that was in a basket with pink nail files and pink pens (they just do this for October). I can’t tell you why I picked it up. I kind of wonder myself. I don’t have a gun, so I didn’t pick it up to shoot it and then write a blog post about it (though that would be way cool). I didn’t pick it up to wear it, because wearing it would be gauche with jeans and a t-shirt let alone a black pinstriped business suit. I didn’t pick it up to do anything with it. I just grabbed one and then dropped it into the bottom of my brief. I sat in the waiting room and held back the tears because it hurt a lot and I was pissed that I even had to go through this. And I looked around at the other women in the room and was pissed for them too. I didn’t want these women to see me walking with a cane because I didn’t want to scare them. I’m scared and hurting and pissed and now I have a pink ribbon pin. But why? In some odd way it’s kind of like a personal medal. It’s something I’ll stow away with my old nursing pin, the honor society pin, the tap dancing charms, and the fellowship pin. Just something between me and the universe. It’s kind of like a milestone in an odd kind of way. A tiny little ribbon of hope on a day when I needed it most. Guess that’s not so bad to keep among one’s tangible reminders of success amid challenge. 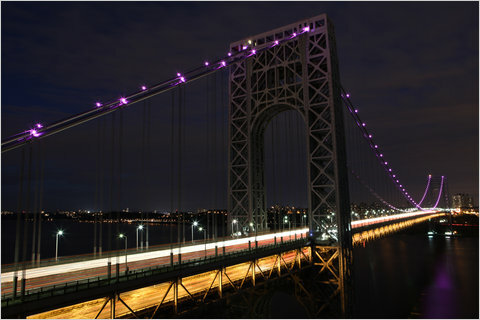 This entry was posted in Breastploitation, My Stage IV Life and tagged breast cancer, George Washington Bridge, hope, metastasis, metastatic breast cancer, pink ribbon, pink ribbon pin, Stage IV, stage iv breast cancer, support, vulnerability. Bookmark the permalink. I can’t believe the GW is in pink. Really? And… no poking fun at the brain stuff, ya hear…. We got your back on all of this…. I hate that you are still dealing with the pain. Will plan a day back to Manhattan after next week. Litter box changer at your service any day. Maybe on a 3x week schedule. Just text me “meow”. like a secret message. While I was getting my first bout of chemo someone came in with gift packs for all the ladies: makeup, deodorant (!) and… hair care products!!! Seriously? Handing out hair care products to bunch of bald and balding women in the chemo day treatment center. New heights of insensitivity. Unbelievable. Like having a pig roast at the center of an Orthodox wedding feast! Bet most of the cosmetics contained breast cancer-causing parabens, too! Dahling, in my slow, brain-foggy way, I just finally put you & your blog name together. Head slap!! Sigh. My acute treatment was happening during October, too. I remember with great poignancy how, during that treatment and my first several visits with my docs, when I saw little pink stuff, I was just grateful for the shorthand. That wore off, particularly after an incident just after the end of radiation when I told some work friends that, no, I couldn’t go to a big pink fundraising event with them because my breast was red & painful & my armpit was swollen to tennis-ball size from radiation & I couldn’t wear clothes or move. And I was supposed to return to work the next day. Instead of asking me if I needed anything & if I wanted a visit & if one of them could work my hours for me the next day, they responded with uncomfortable silence, went to the event without me & bought me a pink lanyard for my ID badge. So much for the shorthand being translated into real awareness. Hang in there, Scorchy. We got your back. That was so thoughtful. You could have used the lanyard to strangle them. I think back now about how I might have been insensitive to someone going through hell and not connecting the dots. You know, being clueless about it all. And I never even thought to buy them a lanyard. 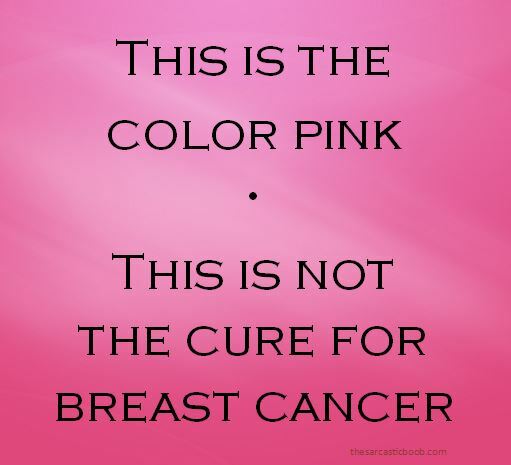 Re: chemobrain. I fear that if I should go through chemo at some point and suffer this awful side effect that I may resort to a vegetative state and the only way people will know if I’m alive is if they put on politics or Howard Stern. I’m sorry you’re in so much pain. I hope you get some relief soon. 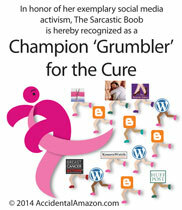 In the meantime you can have the distraction of coming up with 101 hilarious uses for a pink ribbon. Do not be afraid of the pain pills. Use them and keep a constant level in your blood stream and make sure to get enough sleep. This is an order from the professor! Ma’am! Yes, ma’am! I have to do this, then, or I will have my grades reversed! It’s the most hideous coming-of-age badge society has come up with yet…..we all walk by those baskets and think. A lot of things. But you transformed those thoughts and made me laugh at the same time.